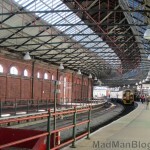 Holyhead Train Station in the U.K. This cost me only 40 euro to book a couple days before I left. The trip took around 7-8 hours but it was quite pleasant. 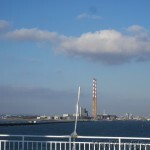 You simply take a bus from Dublin city center to the Port, board a ferry, which has lots of room to walk around, buy food, eat, and relax and, before you know it, you are in the U.K. 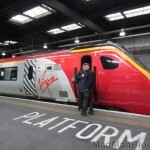 The departure station for the train is Holyhead and the arrival station is London Euston. Don’t worry if you don’t recognize these train stations. The destination for the ferry will be at the Holyhead train station and the arrival point in London (London Euston) is quite a central location, which has a tube station in the same building; therefore, it’s easy to get anywhere in London from this station. Alternatively, you can book both tickets separately. 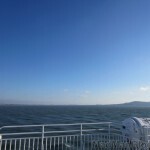 When you choose the ferry to go from Dublin to Holyhead, take notice that there is a fast and a slow ferry. The slower one is nicer, but it takes longer and arrives later. 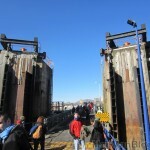 I took the fast ferry and it was ok, but it WILL get you sea-sick if you are not good on moving vessels :(. You can pick-up your sailrail ticket (the single ticket that works for the ferry and train) from the Dublin Port station so that you don’t have to find a printer if you are traveling, this is what I did. Also, you will get a ferry ticket and then another longer ticket that has been filled-in by hand; this second ticket works for the trains once you get into the U.K. – do NOT lose it because it will be checked. 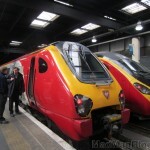 Also, it is not for a specific train, so just hop onto the next train to London Euston. If you are nervous about the ticket, you can find a train-ticket counter in the Holyhead station and ask any further questions there. The general sailrail ticket will also not have a seat reservation for the train or ferry, but that wasn’t a big deal for me. Just find an empty seat and sit down. And, I am not aware of any luggage limits, but you do have to carry everything yourself on the train etc. Oh and DO NOT walk to the Dublin Port. It is much farther than it looks like on the map. I tried to walk there and ended up taking a taxi after I thought I was lost in the loading area of the docks in Dublin. This is not a pedestrian friendly area (especially if you stayed up all night partying with your friends because it was your last night in Dublin 😉 ). The quickest way to get from Dublin to London is with an airplane. The flight itself will be 1 hour give or take 15 minutes, which depends on the arrival airport on the London side. Both websites will compare many different airlines and will allow you to choose the cheapest flight. However, I have found http://www.skyscanner.com to have the cheapest flights. Note that both websites will include fares from the ‘really’ cheap budget airlines such as Ryanair and easyJet. This is important because they have severely restrictive policies, which includes things like a 70 euro penalty for not printing your boarding pass ahead of time and bringing it with you to the airport. Right now, I am looking at flights between 55 and 80 euro roundtrip between Dublin and London. With these prices, be careful to pay attention to the arrival airport. You may end up in an airport that is far away from London or one that costs 15-20 pounds to take the bus into London. Factor the added costs of getting to and from the airport into your price calculations. The bus from Dublin to London is an over-night bus. I did not take this because I find it very difficult to sleep on a bus, especially since you may go through customs on the U.K. side of things and can, therefore, not sleep the entire time. I have never met anyone who has taken a night-bus and said that they had enough proper sleep to feel refreshed and ready to go the next day, so be careful choosing this option. The price for a bus fare there and back is around 55 euro when you book in advance. The other good thing about this is that it drops you off at the Victoria Coach station in London. This is a really big and main station that is well connected to the rest of the city. Remember that on a bus or ferry+train, you do not have to pay for baggage. This is a big plus if you have a lot of crap and want to avoid high airport fees. 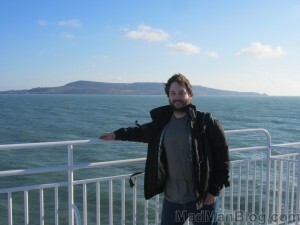 Also, there was no customs or passport check in Holyhead or anywhere when I arrived via the ferry to the U.K.